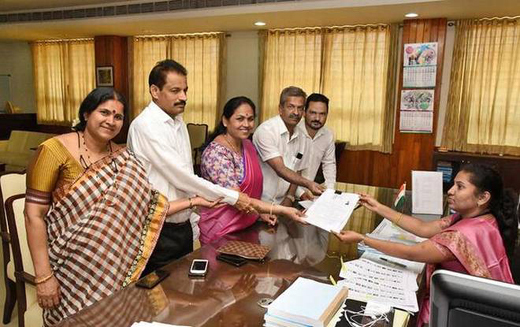 Udupi, Mar 23, 2019: Shobha Karandlaje, Bharatiya Janata Party (BJP) candidate for the Udupi-Chikkamagaluru parliamentary seat, said on Friday that there was no dissatisfaction in the party over her candidature. Addressing presspersons here after filing her nomination papers, Ms. Karandlaje said there might be many aspirants for party ticket in the constituency, but once the party decides on the candidate, everyone works like soldiers on the ground. “The ‘Go Back Shobha’ calls and appeal to vote for NOTA instead of the BJP is a conspiracy of the Congress. No one from the BJP is involved in it. I am confident that I will double my margin of victory this time from 2014,” she said. She said she had done her best to get projects and schemes of the Union government to the constituency. Still, the problems of arecanut and coffee growers need to be addressed. “The people want the decisive leadership of Prime Minister Narendra Modi and will re-elect the BJP,” she said. She also said the ‘Mahagathbandhan’ was a coalition of several parties vying for power without any goal. “The Congress-Janata Dal (Secular) government in the State is the best example of a ‘Mahagathbandhan’ where the coalition parties are constantly fighting,” she claimed. Ms. Karandlaje said she filed her nomination papers in a low-key manner on Friday because of the muhurta and as it was a “holy day”. She will file them again, this time after taking out a large procession of BJP workers, on March 26. Defence Minister Nirmala Sitharaman is expected to address a public meeting here on that day before the submission of papers. She will also hold an interaction with the fisherman community, Ms. Karandlaje said. To a query, she said the Congress was in a “pathetic condition” as it had to surrender the Udupi-Chikkamagaluru seat to its ally JD(S) even though former Prime Minister Indira Gandhi had won from Chikkamagaluru in the bypolls held in 1978.